Re: Any high speed railway tunnel? There is a Japanese pak set of "double-track" tunnel with 450km/h of maximum speed. I use it a lot in my save. More than one year passed and I returned to work on new tracks for pak128 (may it be that it will be used only in pak128.CS). Currently you can test this prototype of track for speed 280 km/h. ... but I have not experience with these tiles yet. If you think my last work, prototype of track for speed 280 km/h, than you have a bit strange scale of beautifulness - because it is a really awful work - and unfinished. I got somewhat stuck with bridges and tunnels. A good idea, if you feel like sharing the work, is to keep the track (ballast+sleepers+track) the same for a given speed and as similar as possible to the others. Details could still change, but the main goal is an overall consistency. As the eras change (25 years periods), tracks will change their scope. Sume will survive, other retired. All infrastructure (bridges+elevated and tunnels) need to change according to the "look&feel" of the tracks in that era. I use GIMP for all my graphics, I can import multilayer XCFs and PNGs. Fabio, since those tracks have been finished for such a long time, perhaps you should do a partial release, of the tracks and some of the finished tunnels/bridges. The old bridges can work as placeholders in the meantime. This would make sure it doesn't slip out of memory of others, who in turn would perhaps do the same work again. May it be - I began preparing my tracks in accordance with original set. It would be good if you would download prototype (link is few posts above) of my track, see it and say if it is usable by yourself. It seems too high to me for this age - I would like to suggesting shifting of these two tracks by one age (those 25 years). Only few trains could go by this speed - but technically they went only about 120 and 130 km/h. Yes, it is very good idea - to let tracks change as time goes. But most important it is with tunnels. Yes. Thanks. It means I can export my track per parts - for easier improves. This is very sensible. Perhaps I'm too ambitious and I want to release all the time a full set. I will see when I can access the sources (they are on a different PC) and release a test pak. There won't be more than 4 tracks (+bridge +tunnel +elevated) available at any given year. Pretty much as it happens with roads. 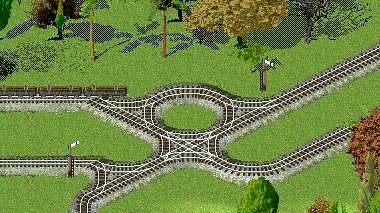 Tracks are supposed to have a ceiling speed: if just a train can go this speed between the start of the era and the beginning of the next one, the tracks should be available for the era. Of course these tracks will be cutting edge technology for the time, but it allows to design a network which can be fully exploited for the present era and for the next one (up to 25+25=50 years, a reasonable lifespan for a railways infrastructure) without being upgraded. Also in Real Life tracks are often designed for a higher speed than what the rolling stock presently allows to. Moreover, the 400 kph tracks will e.g. allow for trains for such speeds as 360 kph etc... which couldn't exploit their max speed on "slower" 320 kph tracks. Note 2: the numbers are rather old, from the old closed source pak128. Since many vehicles have been dropped since and other have been added, figures could eventually change, but this table gives the idea of the general trend. Tracks will change purpose but preferably not the look. Some bridges and tunnels will greatly change their appearance in time. By the way, which programs do you use? Corel Draw 9. May it be that it is not perfect tool for painting of such graphics - but I am getting to be better. It can be seen on some addons I made. And finishing works are in GIMP (but I am not good in using of it). Very well thought of timeline and speed combination Fabio. Certainly a great improvement to the present state in the pak. I decided to publish sources for prototype of new track for speed 280 km/h. There are used few new parts. There are few night-lighting pixels - and I am sorry for them. I hope that I will publish new version of graphics soon - and it would be in GIMP XCF file - and also as PNGs - in accordance what I wrote in one of previous posts. At such speeds, simple tunnel portals won't do (for single-track tunnels, which have a lower diameter than the double-track ones). You'll get a tunnel boom, like when firing a firearm, so the tunnel portal needs the equivalent of a suppressor. I'm not a specialist on the issue, but to me (and from the pic) it seems more like replacing the railroad ties (sleepers) instead of replacing the ballast itself. It looks like it's laid on gravel, anyway. The idea is considered, thank you for suggesting. Very interesting, and also very new to me. I know that today many long base tunnels are bored with two tubes. Also, the air shift of two trains meeting in a double track tunnel at these speeds can be disastrous. Again, thank you very much for the ideas. "Slab track" seems to be the term. I learned some things this morning, though, so I'm happy either way. 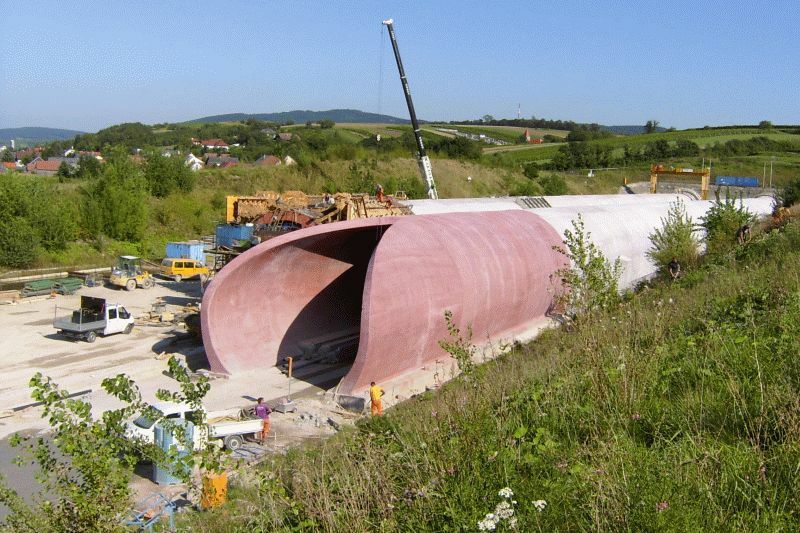 That tunnel is surely very interesting - but as I wrote somewhere else (ROADS REPLACEMENT PROJECT - about else shapes of tunnel), it is shape of tunnel for new ages. And its using in age in accordance with plan as is described above would be very strange. Ages before year 1990 need else shapes. And I don't think that it is so difficult to prepare more tunnels for one track - in comparison with preparing of tracks, themselves. Oh.....?! Wow ! That's awesome. Please excuse me posting about it. I searched this forum but didn't find any reference to that work going on. I had finally managed to resume the work on tracks replacement for a few weeks till now. As usual, I revised a bit my plan, mostly adding more tracks. From 1940 on there will be 6 tracks (5 from 1930) with bridges, tunnel and elevated (for the upper levels) available all the time, with a progressive speed increase. Oh, gosh... that's a plan alright ! It is still a hobby for you, is it ? Hm, with regards to graphical work, I would not dare approach anything else than regular tracks on flat ground. Seeing their WIP percentage being rather high, I do not guess my noob assistance would be of any good to you, or would it ? Oh my..! Those are great news! Is there ANY commercial service on conventional rail (no maglevs) going that fast? Besides, there are no trains of that speed in pak128 (not yet at least). Seeing tracks with a max speed of 480 km/h wuld just mislead them. If trains faster than 400 km/h are going to be painted anytime, we will either update the value, either add a new track type. AFAIK the highest commercial train in europe were the spanish Siemens Velaro trains, which were certified for running at 350 km/h. I think the newest french TGV (AGV) was certified 360 km/h, but not sure. I know that the chinese hst were really fast, but I can't say how much is "fast". Definetly, I'd say 400km/h is a good limit, unless we find a good reason to use a higher value. Well, they do last until 2989 and there are already speed record runs that go over 480km/h, so I don't think it would be entirely out of the realm of possibility to see a conventional train in service at 400km/h+ somewhere down the line. I'd guess 2050? "In January 2008 a test conducted by Alstom resulted in the train running at the speed of 360.9 kilometers per hour." it´s possible to leave the track for 200 and 280 km/h in devlopent? And a track with 360 km/h be are missing. Here I come with some updates. Ummm... sorry to be the bad guy again, but I can't give up on quality. The tunnels that have only shading and horizontal stripes are almost comic-like.